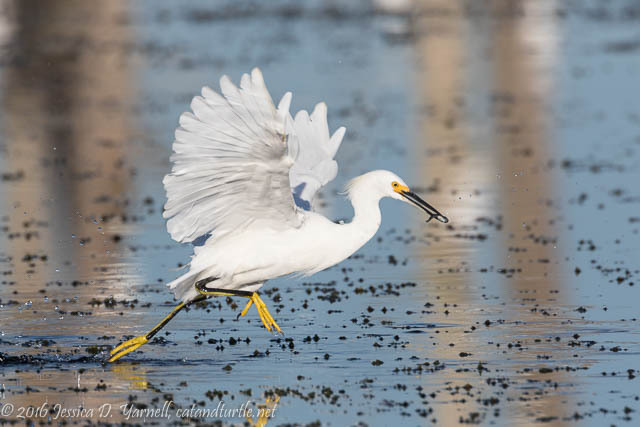 Many moons ago, Michael posted a photo of a Snowy Egret on Flickr that he entitled Tiny Dancer. 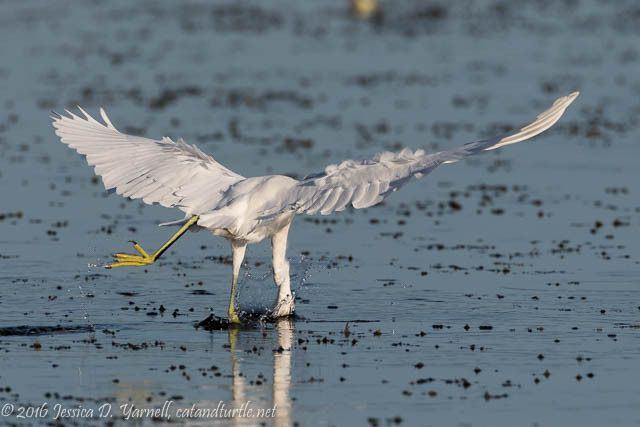 Well, thanks to that photo, I get Elton John in my head every time I see fishing Snowy Egrets! It’s a fitting title, though. The birds are so graceful as they do their over-water gymnastics. At my visit to Orlando Wetlands Park last weekend, the Snowies were one of my favorite photo ops. They are fun to photograph as they dance across the water, looking for breakfast. Tiny Dancer – with Fish! 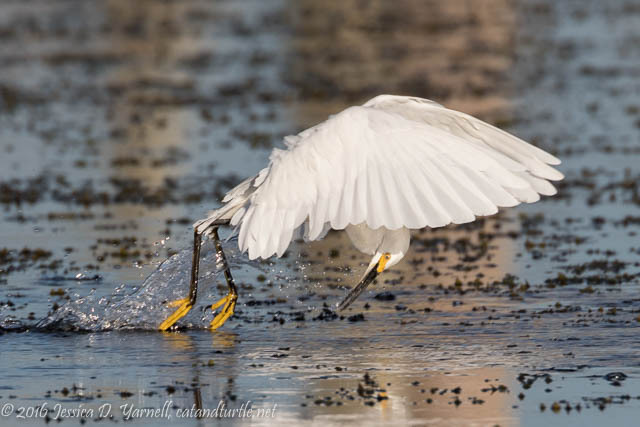 Look at those yellow feet as he runs across the water! If you peek closely, you’ll see the minnow in his mouth. This tiny dancer listened well to his ballet teacher. He remembered to point his back toes and he dove in a form of birdy arabesque! The egrets weren’t the only birds at Orlando Wetlands. Shall I confess to taking pictures of anything that moved, just because I was so happy to get back out with my camera? 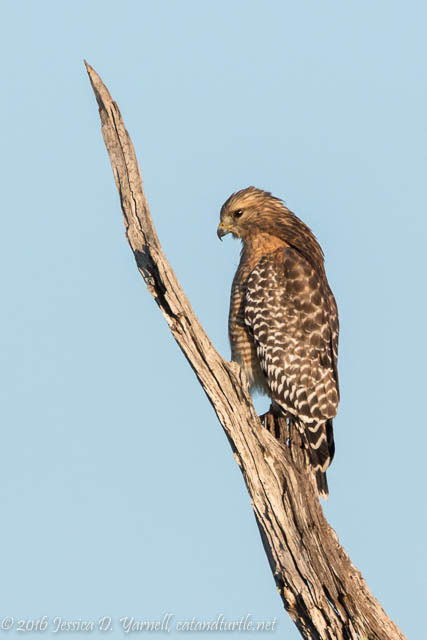 This Red-shouldered Hawk posed at the top of one of the dead trees. He actually blended in pretty well. Such a pretty bird in soft morning light. 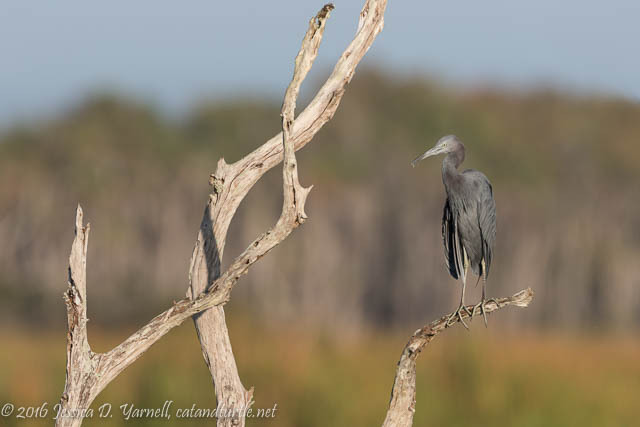 This Little Blue Heron sat calmly on a lower branch. He seemed to agree with me – it was hot out that morning! 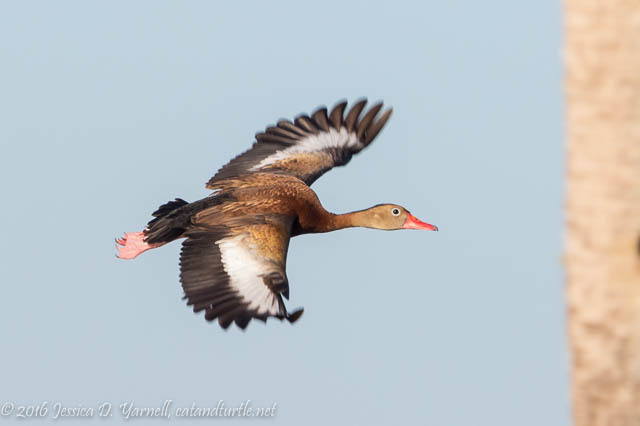 The skies were full of Black-bellied Whistling Ducks, whose cheerful calls echoed throughout the marsh. Mostly they stayed behind me, where I would have had to shoot into the sun to photograph them. Maybe one of these days I’ll return in the afternoon. 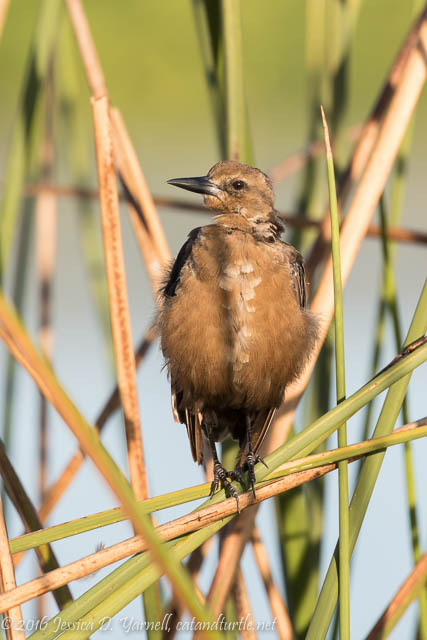 A pair of juvie grackles was preening in the reeds. They made such a fuss! I was a little surprised not to see more little birds in these reeds. I guess I have to wait a few more weeks for some of the winter migrants to arrive. 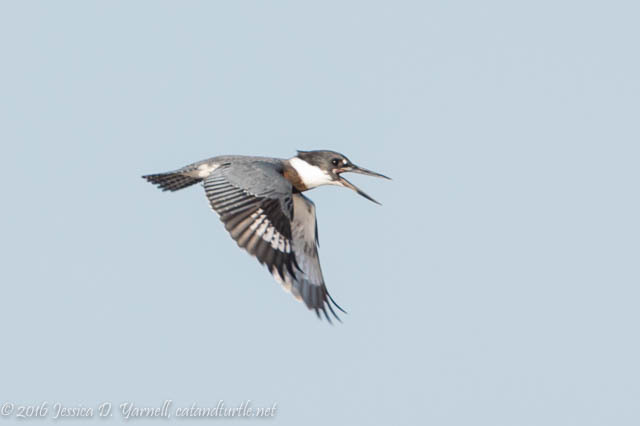 Speaking of winter migrants, the Belted Kingfishers are back already. A pair of them were engaged in a vigorous chasing match. Every time one would land, the other would chase him off. They flew left. They flew right. Up. Down. No branch was a permissible resting place. They chased each other almost the whole time that I photographed the tiny dancers! 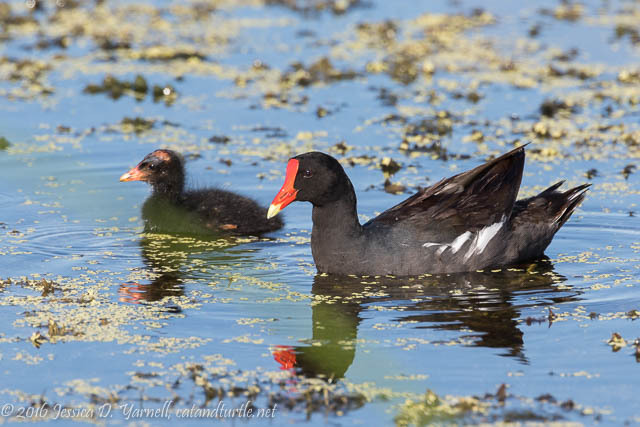 As I walked back, I spotted a Common Gallinule with her young chick. 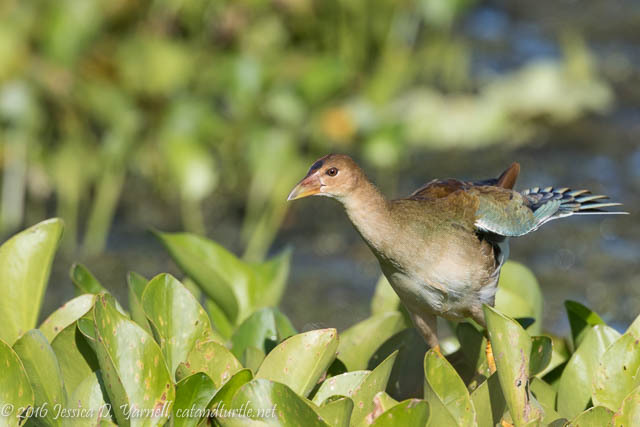 The gallinules raise several clutches in a summer. It’s always fun to come across the babies. They look like little black aliens! Orlando Wetlands is one place where I can reliably find Purple Gallinules, and this day was no exception. I spotted a family of two adults and three juveniles hopping through the vegetation. One juvenile in particular seemed to love to flap his wings. “Look out, world, I’m growing up!” he seemed to say. Maybe next time I’m there I’ll photograph him in his full purple plumage. 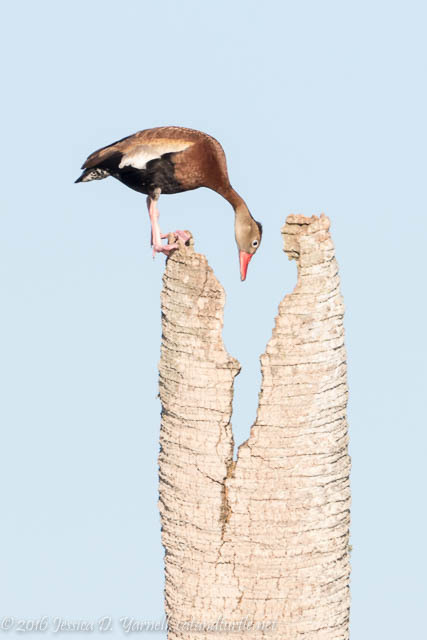 I’ll close with another shot of a whistling duck, one of my favorite birds. They nest in cavities in trees, and I suspect this bird had a small family calling to him from the way that he kept guard over this tree. But if you didn’t know that, you might think he was looking for something that he lost – kinda like me when I can’t find my phone! I’m looking forward to cooler weather and more opportunities to photograph our wonderful winter birds. Stay tuned! Nice shots Jess … reminds me of the time you and I shot out there. So much fun! Really enjoyed the read. Miss you.